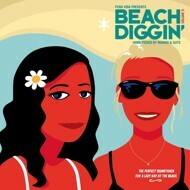 Over the last five years and as many volumes of their “Beach Diggin’” compilations, Guts and Mambo have explored the reefs of five continents, dredged the sea beds of countless seas and oceans, examined every single seashell with the aim of making sure that no vinyl pearl should escape their notice. Tunisian reggae, Japanese disco, West Indian jazz-funk, the duo’s aesthetic dribbling skills would stop the savviest Brazilian football player dead in his tracks, and it was with this in mind, that they proceeded to select their discoveries. With a marked preference for meditative free-diving rather than tour package scuba diving, and isolated spots rather than massively overdeveloped beach fronts. For this latest installment of their adventures, Guts and Mambo have organized another expedition around the world, to salute the spots where for the last five years they have uncovered rare specimens, saving some of them from total extinction, while shining a light on others that amply deserved it. The fifth and last volume of this well and successful series comes with a deluxe packaging as usual.